The charity Mates in Mind today welcomed the publication of the Stevenson-Farmer independent review into workplace mental health and restated its objective to improve the mental wellbeing of workers in the UK construction industry. The review – Thriving at Work – calls for action to tackle the high-levels of poor mental wellbeing that UK workers are suffering. It found that in many workplaces, mental health remains a taboo subject and that consequently opportunities are being missed to provide employees who are struggling, with the help and support that they need. To address this, the report has outlined six key principles that all employers should adopt as a basis for effectively managing workplace mental health. These recommendations highlight the need for companies – irrespective of scale and scope – to encourage a more open and transparent organisational culture that breeds greater knowledge of the issue as well as provision to monitor progress of its effective management. 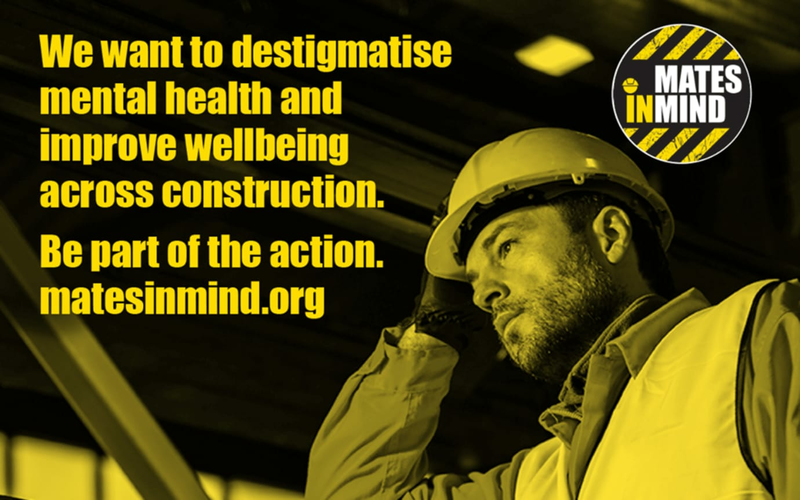 Since its launch in January 2017, Mates in Mind has been working with the UK construction industry to make progress on the issues the report identifies by raising awareness, addressing the stigma of poor mental health and improving positive mental wellbeing. Guidance and support: offering guidance on specific employee issues to creating stress management policies through to connecting the workforce to appropriate support at the right time – Mates in Mind supports companies create and implement a mental health at work plan. Awareness and education: helping to develop mental health awareness throughout the industry – from encouraging open conversation throughout the workforce to helping leaders and managers understand their roles in creating mentally healthy work environments. Communication: helping to ensure the organisation’s commitment to positive mental health & wellbeing remains visible and relevant. From targeted communication materials to supporting organisations in monitoring employee mental health & wellbeing. Research and development: developing industry leading research to understand the nature and impact of mental health, and to ensure development of effective, robust and sustainable solutions. Commenting on the launch of the report, Steve Hails of Tideway and Chair of Mates in Mind said: “Mates in Mind welcomes the recommendations set out in the Stephenson-Farmer report. With the direct support and financial investment from the UK construction industry and the British Safety Council, it has already started to make inroads into tackling the issues that the report so starkly highlights. As an example of the issue, the sad reality that suicide rates in construction are more than 3.5 times the national average. This industry, which contributes 6% to the nation’s GDP, is reliant on people who are at most significant risk – and we need to take even greater care of them.